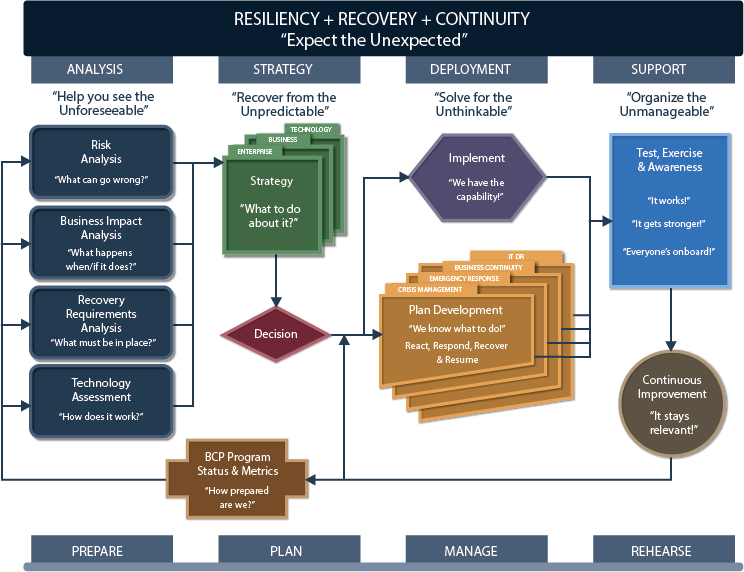 The Eagle Rock consulting practice employs its time-proven comprehensive methodology for Business Continuity and Disaster Recovery Planning. The methodology, shown below, can be used to launch, assess, manage or improve individual parts or entire BC/DR programs. This methodology aligns with recognized Risk, Resiliency and Business Continuity Planning Standards and Guidelines, both international and sector-specific (i.e. ISO 22301, FFIEC, FINRA, HIPAA and others), as well as related standards for IT security, such as ISO 27031 and ISO 27001. Dont forget to check out our Resources that could better assist you with Business Continuity and Disaster Recovery! Need more information on our Program Methodology? Download the PDF version of our Program Methodology for a more in depth view! Customized to meet the unique needs of each organization. 1998 - 2018 Eagle Rock, Ltd. All rights reserved.